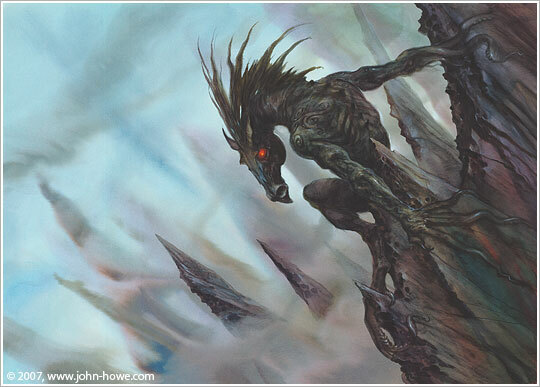 Editor’s Note: This article doesn’t necessarily reflect the views of MTGPrice, but we feel it is a topic important enough to warrant publishing this piece to kick off discussion. Since its public opening in 2013, PucaTrade has rapidly grown to become a key institution in the MTG trading community. There are many factors that have contributed to its rise, among them the establishment of a site currency called “PucaPoints.” PucaPoints have been integral to allowing PucaTrade to flourish as a trading platform. However, this flourishing may prove to be unsustainable in the future unless PucaTrade’s owners rethink some of its policies governing how PucaPoints are managed. This article is an elaboration of a post I had made on PucaTrade’s subreddit over a month ago, entitled “Is PucaTrade a Pyramid Scheme?” In retrospect, this title was likely a bit too inflammatory for the sort of discussion that I was hoping to generate. Nothing in this article should be taken to imply that PucaTrade should be abandoned as a platform or that its administrators are acting in bad faith with their policies. Indeed, I love PucaTrade and will continue to use it even as the problems I’ve observed continue to manifest. Nevertheless, these issues deserve a lot more discussion than they’re currently receiving, as they will in time impact the experience of every user on the site. If you want the “short” 1000-word version of this argument, check out my post above. If you want the full 3000-word discussion, though, navigating from the principles of digital currency management to how these principles are causing issues for PucaTrade to some simple policy recommendations and advice for the users, however, read on. Most readers will probably have some prior familiarity with virtual currencies, if not from using PucaTrade itself than from using some other website or video game that employs one. Why do these currencies exist to begin with? There are two major applicable reasons here: Firstly, by using a site currency rather than USD (as an example), PucaTrade can avoid a lot of the regulatory compliance costs that would come from serving as a real financial intermediary. They can also avoid burdening users with the costs of using a payment system such as Paypal to facilitate digital transactions. Secondly, however, by issuing its own currency the relevant monetary authority (in this case, the PucaTrade staff) can benefit from what is formally known as seigniorage. This is basically the privilege of being able to direct how currency enters the economy – if PucaTrade staff wanted to issue themselves a lot of site currency and use it to have traders send them Tarmogoyfs, then they could probably do this, although this would cause trust in the currency to collapse and kill the site. While I do not believe that the staff would do such a thing, seigniorage is an important part of PucaTrade’s functionality, as the staff use their currency-generating capabilities to institute a variety of policies that they believe will help the community. More on this later. When an institution creates a virtual currency to be used within some economy, proper management of that currency is crucial to that institution’s success. Early online games that used virtual currencies have provided us with many salient examples of the consequences of mismanagement. Diablo II, for example, developed the infamous “Stone of Jordan economy” when its ingame currency became so devalued that ingame gold stopped being the medium of exchange in favor of the difficult-to-acquire but widely-demanded Stones of Jordan. Despite this experience, Blizzard couldn’t get things right and Diablo III ended up experiencing well-documented hyperinflation episodes as well. One of the major issues that monetary authorities must address is how to manage the money supply to avoid a devaluation of currency and the corresponding economic problems that this can create. Discussions of these topics often focus on “currency sources” and “currency sinks” – what algorithmic forces are putting currency into the virtual economy and what forces are removing it? To reference back to the Diablo examples, inflations would occur because currency would be continually generated as monsters were killed in the game, and players did not have strong incentives to do things that would remove money from the economy (such as buy items from vendors.) Inflation and devaluation will occur if the flow of money entering the economy exceeds the rate at which it’s being removed, all things being equal. How do these concerns apply to PucaTrade? Well, it’s important to understand from the start that PucaTrade relies on fixed prices for all cards. Each card’s price is pegged at roughly TCG Mid price, and this peg is maintained regardless of how many PucaPoints are in use. But although PucaTrade fixes prices on individual cards, the PucaTrade economy is not closed. One can buy and sell PucaPoints for USD, and changes in the supply and demand for PucaPoints will impact the currency’s USD price. So the worry about excess currency in the PucaTrade economy is not that Future Sight Tarmogoyfs will go from costing 20k PucaPoints to 200k PucaPoints, it’s that the supply or demand of Tarmogoyfs at the fixed price level will be so far from the actual market-clearing price that no exchanges will occur. Before discussing why this might occur, some additional basic facts about PucaPoints must be understood. As discussed in the Diablo case, balancing algorithmic currency sources and sinks is a necessity to ensure stability on a site like PucaTrade. What, then, are the sources and sinks of PucaPoints? Well, anyone who’s used the site has noticed that you get some currency merely for signing up and completing some basic actions like filling out your profile and sending out your first card over the site. The administrators have decided to use their currency-issuing power to make sure that every new user gets a small amount of currency. I’ve seen some individuals express concern over this, but the money supply scaling with the number of users is actually a rather smart way to prevent the currency from become more valuable simply because the userbase (and hence demand for currency) is growing. It’s also a great way to incentivize new users to try the site – from the newbie’s perspective, you can get some free cards! Additionally, one can buy PucaPoints at a fixed rate of 100 points per USD – this open-ended exchange rate essentially provides a price ceiling on the value of points. Next, and veering a bit into sketchier territory, the site has issued currency for self-promotion. PucaPoint raffles were offered for backers of PucaTrade’s recent IndieGogo campaign when it appeared to be stalling out. Site users can receive PucaPoints by getting others to sign up, which I’ve seen lead to some quasi-astroturfing for the site using hidden referral links. But what’s most overlooked here, and probably more important than any of these other factors as a long-term source of PucaPoints, is what PucaTrade calls its “100% Trade Guarantee”. This trade guarantee is a major factor in PucaTrade’s utility, as it makes trading cards via mail a very safe proposition. On most trading platform if a sender sends a card and the recipient claims to not receive it, the sender simply eats a loss on the card, especially if the package was untracked. However, PucaTrade’s use of site currency has enabled it to implement a trade guarantee whereby if a package is lost, then if the sender is considered to have done due diligence in trying to deliver the package, he will be compensated for the amount of points that he would have received if the trade had been completed normally. The receiver is also refunded the points held in escrow while the trade was being executed. So, in other words, if Alice sends a Polluted Delta to Bob and PucaTrade’s price on Polluted Delta is 2000 PucaPoints, then if Alice’s package is lost then she will be given 2000 PucaPoints and the original 2000 points will also be refunded to Bob. 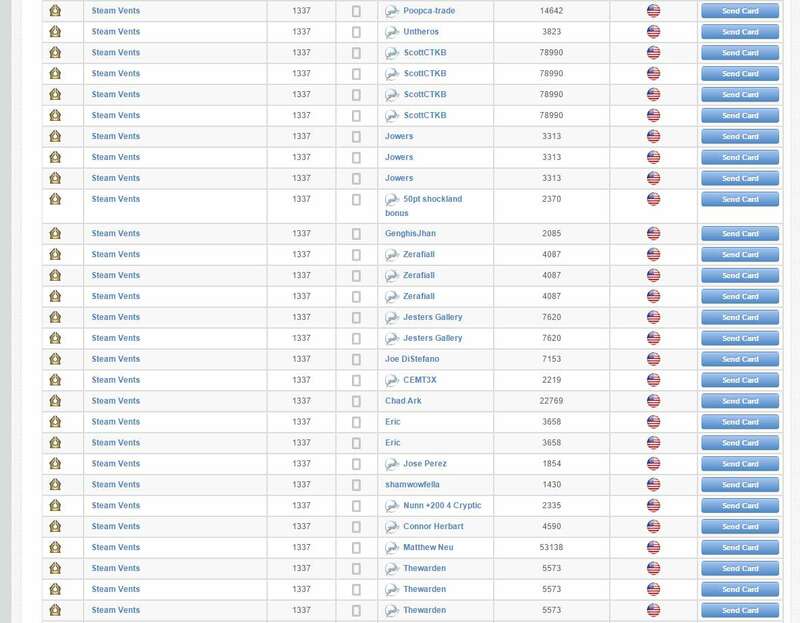 Both traders end up satisfied, but we’ve just seen 2000 additional points enter the system! Note that this amount of 2000 points is likely much larger than the amount of points made for Alice when she generated her account, and if she continues to use the site and the occasional card is lost in transit than she’ll continue to generate more points when the 100% Trade Guarantee is invoked. This means that by virtue of using the site and having a nonzero rate of invoking the 100% Trade Guarantee, Alice will be increasing the money supply over time. This brings us to what I feel is the first major lesson that most users don’t know about PucaTrade: The 100% Trade Guarantee does not provide a free lunch. The 100% Trade Guarantee simply “papers over” feel-bad losses by throwing currency at users. Essentially, this is a sort of insurance policy – when Alice’s package is lost she’ll be compensated, but this comes at a cost to other currency-holders whose holdings are slightly devalued. If Alice is holding currency, then the value of that currency will decline when Bob invokes the policy, or when Carla does, or anyone else. And the costs of an individual case may be diffuse, but across many users they will add up in subtle ways, and in ways that are not only relevant to those who are directly involved in buying or selling currency. To some extent I do think the PucaTrade staff are taking advantage of users here, as the 100% Trade Guarantee is wildly popular but in large part this is because its users don’t appreciate its impact on the overall value of the currency. On the other hand, I’m also not saying that the 100% Trade Guarantee is a bad policy even in light of this – perhaps some sort of sender insurance is simply the right way to go for trading platforms, and PucaTrade has implemented a relatively frictionless version of this. However, the fact that other trading platforms do *not* offer these generous policies is directly attributable to their not having their own site currencies that can be used to subtly spread losses among the userbase. Before moving onward, an important caveat should be given: I’m not 100% sure that any of these mechanisms are actual money sources. The staff could simply be giving out PucaPoints that they’ve acquired through sending out cards or some other means, but I highly doubt that that’s the case and they’ve had multiple opportunities to say that my assumptions here are wrong in prior discussions. The PucaTrade economy has almost no real money sinks beyond when the occasional user is banned with a lot of points in their account, and I doubt this really amounts to much. I would guess that the 100% Trade Guarantee is not only responsible for the majority of PucaPoints being generated, but that its share will continue to increase over time, as it will lead to currency being generated at a roughly-constant rate relative to the size of the overall economy, whether or not the userbase is growing or not. So what does this mean for PucaTrade’s economy, exactly? The reason why I made my original post on this topic on Reddit was because I had noticed that the price of PucaPoints for USD seemed to be declining over time. While one can always buy PucaPoints from the site directly, it’s perfectly okay to sell PucaPoints for USD. When I started using the site in January, informal sales of PucaPoints tended to put the price at around 85 cents per 100. When I made my post in June, that price had fallen to 75 cents. Now at the beginning of August, the market price of PucaPoints is at roughly 70 cents per 100 and threatens to fall further – as of 8/13, I just saw my first offer to sell at 68. So here’s lesson #2: The price of PucaPoints is hugely important for what can be traded via PucaTrade. Many people wrongly believe that since PucaTrade pegs its prices to TCG Mid, then changes in the currency supply won’t affect the availability of cards on the site. Those people are wrong, because changes in the currency price will affect which cards are supplied and demanded via PucaTrade. As an example of why this is true, I used a thought experiment in my Reddit post: Imagine that in some horrible dystopian future Alice were willing to send Polluted Deltas on PucaTrade for 2000 PucaPoints, but also that PucaPoints could be bought at a rate of 20 cents per 100. This would imply that anyone could spend $4 to get 2000 PucaPoints, add a Polluted Delta to their “Want” list on the site, and then be eligible to receive the card from Alice. The obvious result here is that you’d have a massive excess demand for $4 Deltas on PucaTrade, and the average user would simply no longer be able to acquire Deltas – or any other staple cards for that matter – within a reasonable timeframe. As of this writing the low price of a NM Force of Will on TCGPlayer is $99.75 with shipping. 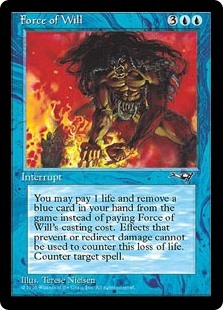 On the other hand, Force of Wills can be acquired for 11202 PucaPoints. At an exchange rate of 100 points for 70 cents, this is the equivalent of $78.41. At this price, what stops everyone from just purchasing FoWs from PucaTrade? The answer is one that we see all the time in real worlds when price controls are employed: Queues develop. If you want to get a Force of Will, you will likely be waiting for weeks or months. Because of the falling price of PucaPoints and the increased demand for staples this creates, the PucaTrade dream of trading your standard chaff into Force of Wills or dual lands is quickly dying. Ultimately, I’m very confident that the ongoing devaluation of PucaPoints is due to the monetary issues I’ve outlined above. I’m not certain how much of the growth in the money supply is attributable to the 100% Trade Guarantee, but even if it’s small it represents a mechanism that is going to continually devalue the currency even with a constantly-sized userbase. In many cases, users have responded to this devaluation and the lengthening queues on staples by offering “bounties” on particular cards – specific offers to transfer extra points to senders when a desired card is received. This is a very clumsy and non-scalable workaround to the underlying issues, but in some sense it does keep the dream on life support. If you really want your Force of Wills, you can just offer extra points for them. But maybe declaring the dream “dead” is too fatalistic. Lesson #3 explains why the sky isn’t falling: Because the falling PucaTrade price stimulates demand for various cards, cards where there had previously been excess supply are now becoming easier to send out via PucaTrade. The previous dream was difficult to achieve because for most cards on PucaTrade – standard cards in particular – supply exceeds demand, and users would have to use tools such as MiseBot or PucaPower to try to send out cards where sending opportunities would disappear in seconds because of massive excess supply. For this reason, one could argue that the aforementioned PucaTrade dream never really existed, as the difficulty of sending out bulk cards via the site was often downplayed. In the future, if the currency continues to fall, this will simply rebalance supply and demand on each individual card – the ones that have excess demand will continue to become harder to acquire (in recent weeks users have started complaining about the difficulty of acquiring shocklands), but the ones that have excess supply will become easier for users to trade out in order to acquire whatever cards that are still acquirable via PucaTrade. This is the core dynamic that is playing out as the currency devalues, and it’s even possible that on net the optimal price of PucaPoints for the site itself and its community is somewhere around where it is now. But even if it were, if my assumptions about how the supply of PucaPoints are managed are correct, we would end up sliding past whatever ideal point that may exist as this supply continually expands due to its governing algorithms. So why hasn’t this issue received much attention already? As I alluded to earlier, I think part of the problem is that people don’t really understand the full picture of what’s going on, and the site staff have structured the site in a way that obfuscates exactly how these policies are impacting the health of the platform. People think that the 100% Trade Guarantee is a free lunch rather than a policy that compensates unfortunate (or lazy or malicious) senders by redistributing value from currency-holders to the sender. People think that the devaluation of the currency isn’t linked to the availability of cards that can be sent or received via PucaTrade. People see the outstanding and largely-deserved growth rate of the site and think that everything is great. Indeed, rapid site growth would in fact slow the phenomena I’m worried about. However, high exponential growth in the userbase will not continue forever, and when things level out we’ll still have a lot of flowing money sources in the economy without corresponding money sinks. In a response to my Reddit post, site founder Eric Freytag pointed out that the velocity of PucaPoints was increasing over time, which he argued indicated that the supply of PucaPoints wasn’t keeping up with site growth. 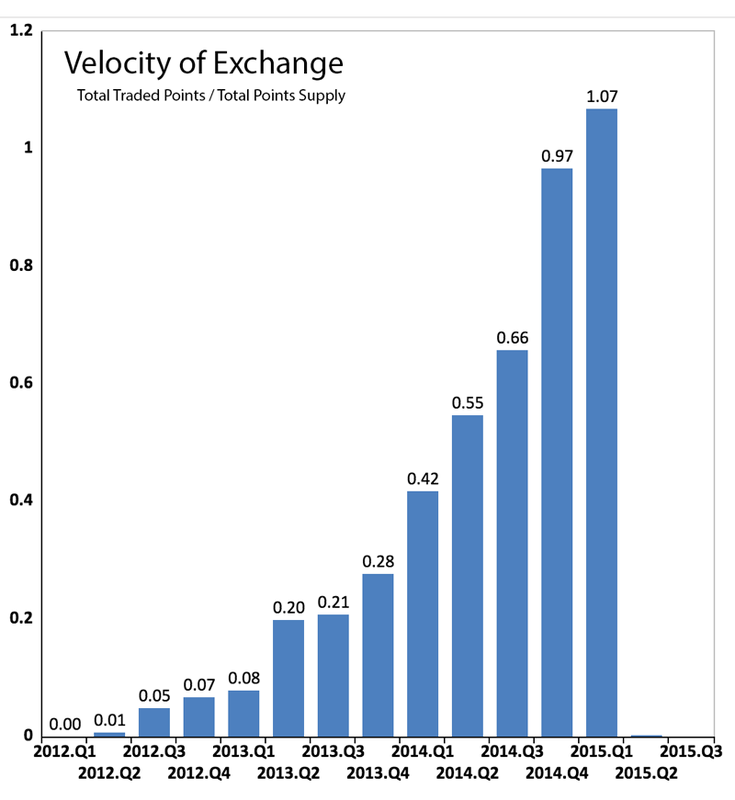 To me, this misses the point: The goal of PucaTrade’s monetary policy should not be to keep the velocity of the currency constant, but to keep its value stable at some determined optimal level. The increase in velocity, as he pointed out, is a positive indicator for the site’s health, but it’s a positive indicator that exists despite the underlying monetary issues. I waited on writing this article because I felt like rather than just arguing these points I could simply let my predictions be borne out, and I believe that this is happening. More cards are becoming difficult to acquire on the site and PucaPoints are readily available for below the 75-85 cents per hundred range that Freytag argues is the historical norm. Left unchecked, expect prices to drop below 70 cents per 100 PucaPoints by the end of summer. Move away from fixed prices: There are many arguments for why PucaTrade should stop fixing the exchange values of cards regardless of its currency issues; namely, this would allow for prices to equilibrate supply and demand regardless of the value of the currency. The main drawback is that money supply growth would translate into inflation, and a high inflation rate could cause problems for the site’s usability. Relax the 100% Trade Guarantee: This would be pretty unpopular, but a lot of that unpopularity would be based on people not understanding how the trade guarantee is really an insurance policy paid for by all currency-holders. It should be possible to implement a more-transparent insurance policy that doesn’t inflate the money supply. I hate to use the word “tax” here, but simply taking some small percentage of PucaPoints from all users every month to cover the costs of the Trade Guarantee (and perhaps offset other money sources) would stop ongoing devaluation. Add money sinks: A tax as outlined above would essentially represent a money sink, in that it would either remove currency from the economy or offset the need to employ money sources. While I don’t expect an actual tax to be implemented, one proposed money sink has been to allow users to purchase PucaTrade’s premium membership levels using PucaPoints rather than USD. This would remove a steady flow of points from the economy, although it might be too little or too much. The main drawback here is that this would surely have a negative impact on the site’s revenues, and administrative reluctance to do this is perfectly understandable. The dream scenario would be that this pushes the price of PucaPoints so high that it hits the 100 per USD ceiling again and the site starts selling more currency, but I am not particularly confident that this would occur. Do nothing: Again, the sky isn’t falling. There’s no need to sell off your PucaPoints immediately. I mean, it’ll take years for the gears to really grind to a halt on the site, and in internet terms that’s a really long time! Buy in bulk: Having a single Breeding Pool or Steam Vents on your Wants list can lead to your waiting for weeks. However, if you have a full playset of shocks on your list, then someone who is interested in sending several at once may choose you as the recipient. Having a bunch of shocks on your Wants list for a week or two and having them all taken at once is incredibly awesome. Offer bounties: Yeah, this is costly but it does work. Even a small bounty on a card will set you apart, if you’re willing to pay it. Have an inviting profile: If I’m going to send out a card where there’s excess demand on PucaTrade, I always check out people’s profiles and try to find someone who appears experienced and is unlikely to hassle me over card condition peccadilloes or other possible shipping issues. Buy a silver/gold membership: This is really an extension of the previous point – users with paid memberships tend to appear more trustworthy as they have some sort of investment in the site. This is hardly the only reason to buy a membership, but I think it’s a massively underappreciated one! In closing, the PucaTrade system as it stands has some important cracks in its functionality, and it’s important for the community as well as the site staff to understand the nature of these issues so that good policies can be implemented without creating uninformed blowback. Importantly, I don’t claim to know what the price of PucaPoints “should” be to make the site work most efficiently for the largest number of people, but if we’re not paying attention things will slide past that point pretty quickly, if they haven’t already. Part of what I’d like to see from PucaTrade staff is more transparency concerning how much currency is being generated and how long the average wait times on various staples are changing over time. The above velocity chart is a very paltry start. I’m open to being proven wrong here if the right data can be provided. Let’s kick off a real discussion here.